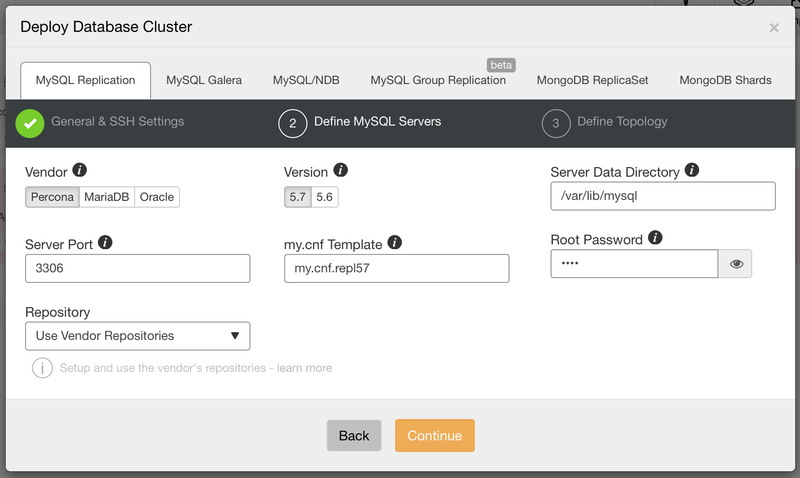 In our previous blog, we saw how easy it is to get started with RDS for MySQL. It is a convenient way to deploy and use MySQL, without worrying about operational overhead. The tradeoff though is reduced control, as users are entirely reliant on Amazon staff in case of poor performance or operational anomalies. No access to the data directory or physical backups makes it hard to move data out of RDS. This can be a major problem if your database outgrows RDS, and you decide to migrate to another platform. 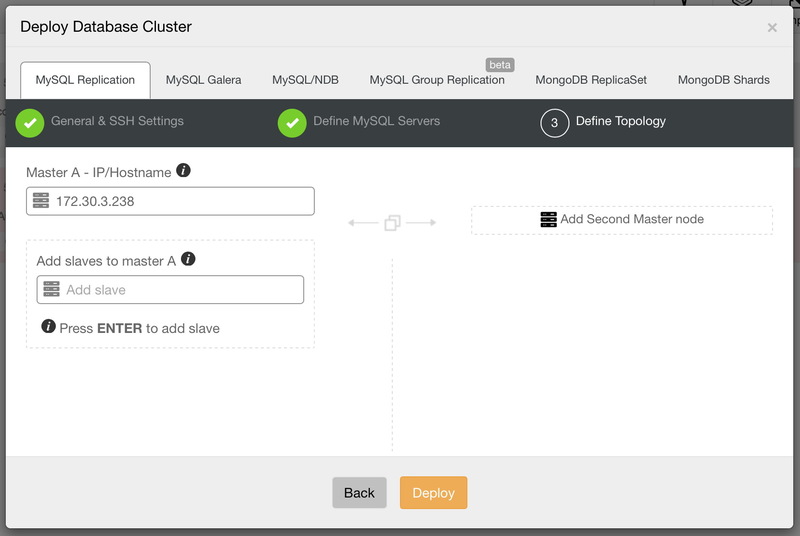 This two-part blog shows you how to do an online migration from RDS to your own MySQL server. We’ll be using EC2 to run our own MySQL Server. It can be a first step for more complex migrations to your own private datacenters. EC2 gives you access to your data so xtrabackup can be used. EC2 also allows you to setup SSH tunnels and it removes requirement of setting up hardware VPN connections between your on-premises infrastructure and VPC. Before we start, we need to make couple of assumptions - especially around security. 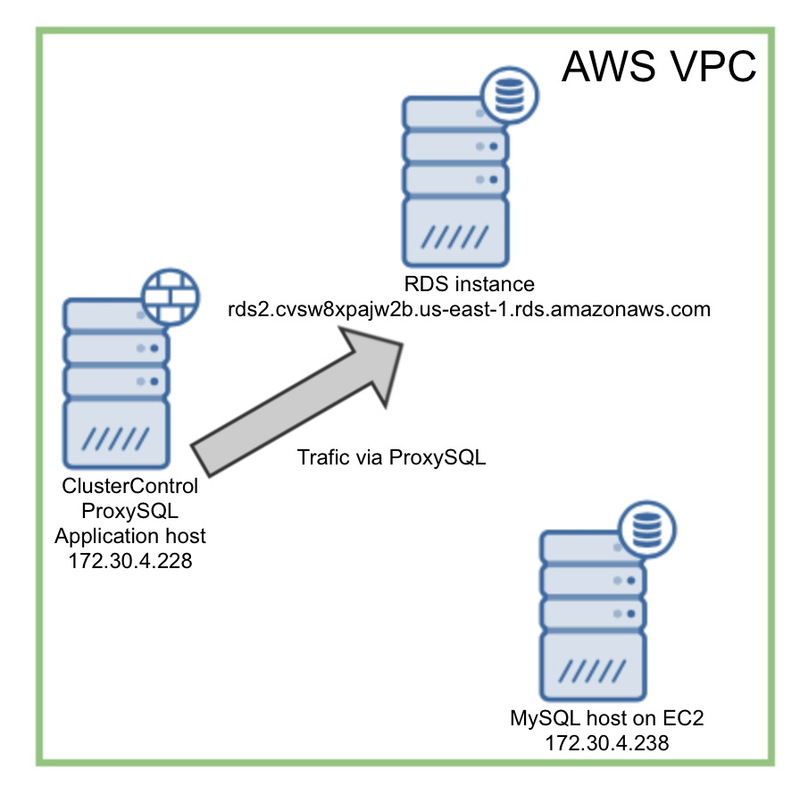 First and foremost, we assume that RDS instance is not accessible from outside of AWS. We also assume that you have an application in EC2. This implies that either the RDS instance and the rest of your infrastructure shares a VPC or there is access configured between them, one way or the other. 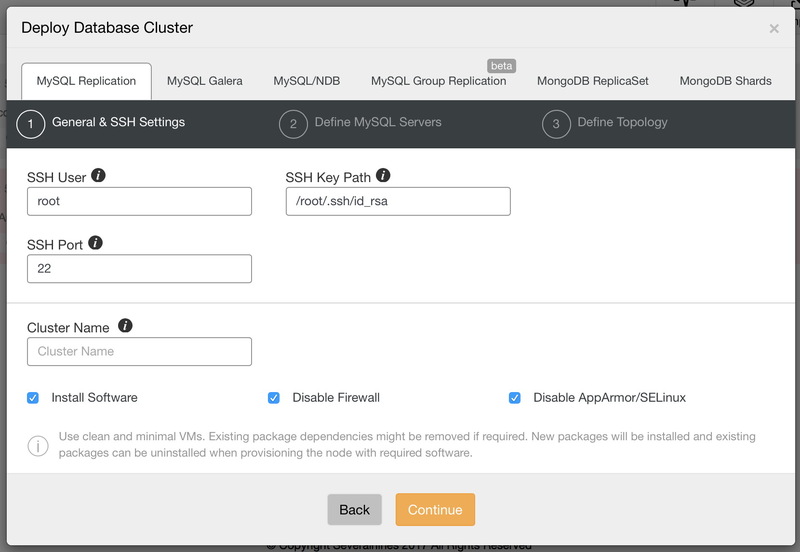 In short, we assume that you can create a new EC2 instance and it will have access (or it can be configured to have the access) to your MySQL RDS instance. We have configured ClusterControl on the application host. We’ll use it to manage our EC2 MySQL instance. Next step will be to install ProxySQL - starting from ClusterControl 1.4 you can do it easily from the UI. We covered this process in details in this blog post. When installing it, we picked our application host (172.30.4.228) as the host to install ProxySQL to. When installing, you also have to pick a host to route your traffic to. As we have only our “destination” host in the cluster, you can include it but then couple of changes are needed to redirect traffic to the RDS instance. ClusterControl configured ProxySQL to use hostgroups 10 and 20 to route writes and reads to the backend servers. We will have to remove the currently configured host from those hostgroups and add the RDS instance there. First, though, we have to ensure that ProxySQL’s monitor user can access the RDS instance. We need to grant this user access to RDS. If we need it to track replication lag, the user would have to have then‘REPLICATION CLIENT’ privilege. In our case it is not needed as we don’t have slave RDS instance - ‘USAGE’ will be enough. Now it’s time to reconfigure ProxySQL. We are going to add the RDS instance to both writer (10) and reader (20) hostgroups. We will also remove 172.30.4.238 from those hostgroups - we’ll just edit them and add 100 to each hostgroup. Last step required before we can use ProxySQL to redirect our traffic is to add our application user to ProxySQL. Quick note - we executed “SAVE MYSQL USERS TO MEMORY;” only to have password hashed not only in RUNTIME but also in working memory buffer. You can find more details about ProxySQL’s password hashing mechanism in their documentation. We can now redirect our traffic to ProxySQL. How to do it depends on your setup, we just restarted tpcc and pointed it to ProxySQL. At this point, we have built a target environment to which we will migrate. We also prepared ProxySQL and configured it for our application to use. We now have a good foundation for the next step, which is the actual data migration. In the next post, we will show you how to copy the data out of RDS into our own MySQL instance (running on EC2). We will also show you how to switch traffic to your own instance while applications continue to serve users, without downtime.